When I mention my homemade bread, I get a lot of request for the recipe. It isn't a recipe that I can share because I make the bread from a starter. I've had the starter for over 15 years. It is a potato sourdough starter, and it makes the most delicious bread! 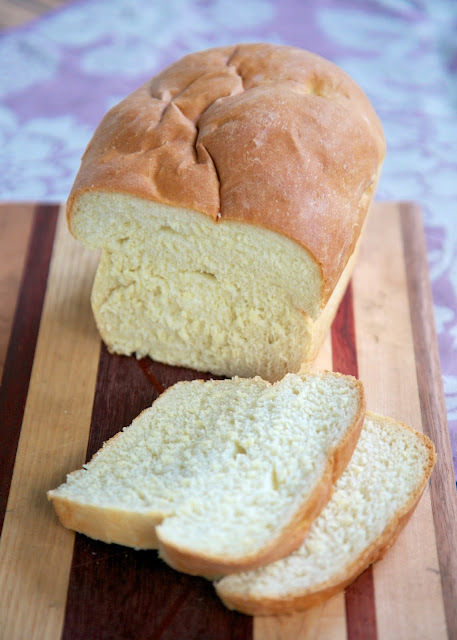 I've been looking for a quick bread recipe that would be comparable to my homemade bread. I ran across this Amish White Bread and decided to give it a shot. It is simple to make and tastes great! This bread is much firmer than my bread made from the starter. It is great for sandwiches. We also used it for French Toast. This is much easier to make than my homemade bread from the starter, plus you don't have to fool with feeding a starter every week. It only takes about 2 hours from start to finish. This recipe makes two loaves. Eat one and give one away (or freeze it for later). 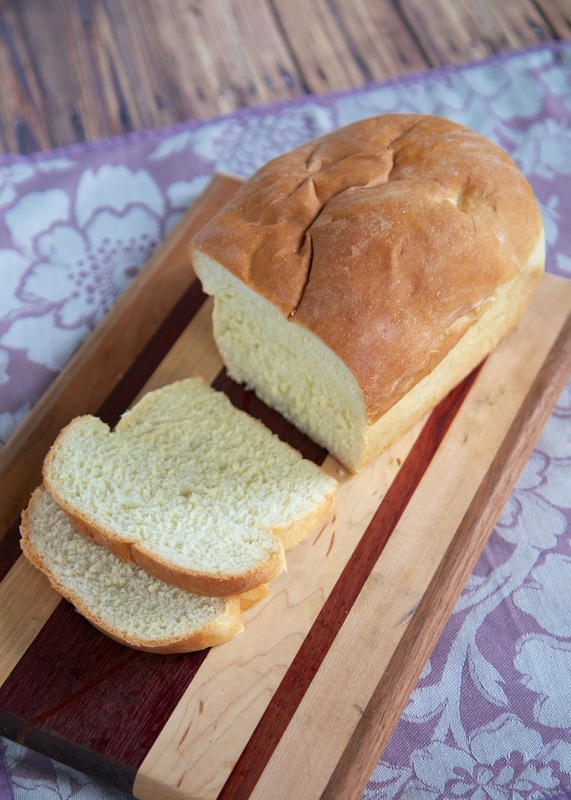 This bread is great with the Amish Peanut Butter Spread, Creamy Honey Butter and the Cinnamon Honey Butter on the blog. In the bowl of an electric mixer, dissolve the sugar in warm water, and then stir in yeast. Allow to proof until yeast resembles a creamy foam. Mix salt and oil into the yeast. Using dough hook, mix in flour one cup at a time until dough forms a ball and pulls away from sides of bowl. Place dough in a well oiled bowl, and turn to coat. Cover with a cloth, and allow to rise until doubled in size, about 1 hour. Punch dough down. Divide in half. Shape into loaves, and place into two well oiled 9x5 inch loaf pans. Allow to rise for 30-40 minutes, or until dough has risen 1 inch above pans. Bake at 350ºF for 25-30 minutes. Prob a dumb question but any type of oil?!? Olive? This is my 'go to ' bread recipe. I have made it for years now. To answer Jan's question, you just use vegetable oil. The amount of sugar originally calls for 2/3 c but 1/2 should work just fine ! Love it. Thanks for sharing the goodness so others can enjoy it. Best bread ever. You can use vegetable, corn, canola, etc. oil. Olive oil maybe a bit too strong for bread. I will usually make one loaf and 1 pan of caramel rolls. Excellent. what if you don't have a kitchen aide with a dough hook? can you go old fashion and knead with the same results? And does it have to be bread flour .. i'm pretty sure the amish don't have robinhood bread flour?